NASA is giving university and college students an opportunity to be part of the agency's journey to Mars with the Breakthrough, Innovative, and Game-changing (BIG) Idea Challenge. NASA's Game Changing Development Program (GCD), managed by the agency's Space Technology Mission Directorate in Washington, and the National Institute of Aerospace (NIA) are seeking innovative ideas for generating lift using inflatable spacecraft heat shields or hypersonic inflatable aerodynamic decelerator (HIAD) technology. 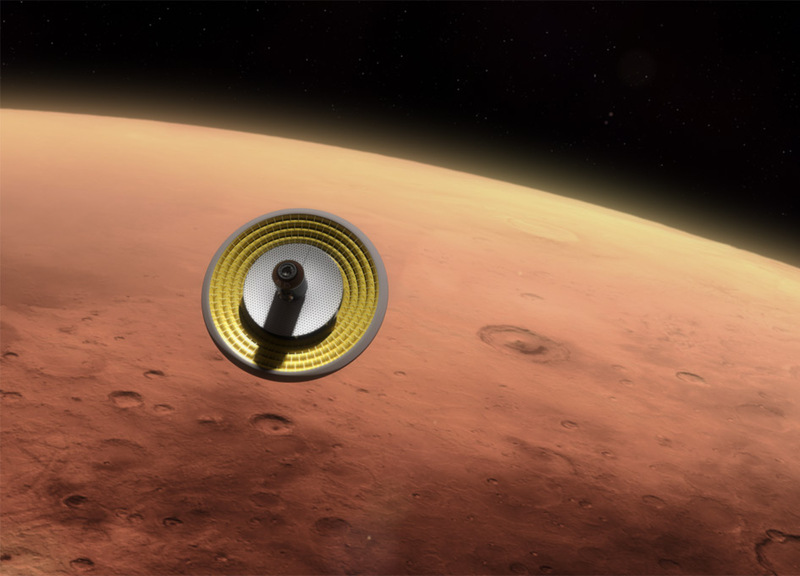 "NASA is currently developing and flight testing HIADs -- a new class of relatively lightweight deployable aeroshells that could safely deliver more than 22 tons to the surface of Mars," said Steve Gaddis, GCD manager at NASA's Langley Research Center in Hampton, Virginia. "A crewed spacecraft landing on Mars would weigh between 15 and 30 tons." The NASA's Mars Curiosity rover is the heaviest payload ever landed on the Red Planet -- weighing in at only one ton. To slow a vehicle carrying a significantly heavier payload through the thin Martian atmosphere and safely land it on the surface is a significant challenge. NASA is addressing this challenge through the development of large aeroshells that can provide enough aerodynamic drag to decelerate and deliver larger payloads. HIAD technology is a leading idea because these kinds of aeroshells can also generate lift, which would allow the agency to potentially do different kinds of missions.